Even though the turkey is the star of the Thanksgiving dinner, my favorite part is always the sides and the desserts. Since I’m not much of a pie person, I like to have at least one cake for Thanksgiving. 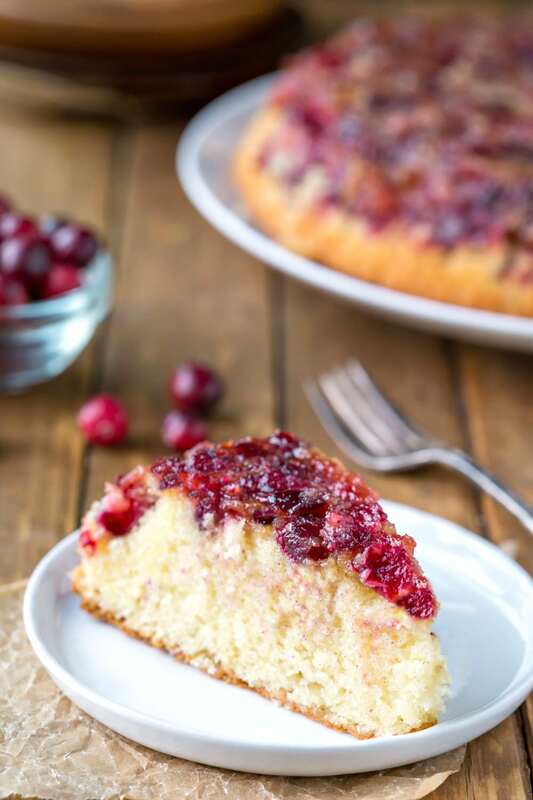 This cranberry upside down cake is a great option for Thanksgiving dessert. 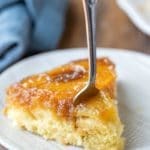 It is very easy to put together and is a yummy combination of sweet and tart. The cake itself is a sweet vanilla cake. 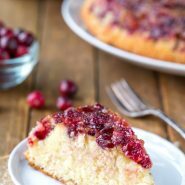 It’s topped with a buttery brown sugar cranberry topping. The cranberries in the topping bake down to an almost cranberry-sauce consistency and are so delicious with the cake! Moist white cake topped with cranberry topping. Put butter in 9-inch round cake pan, and place it in the oven while the oven preheats. Leave it in there until it melts (keep an eye on it, though). 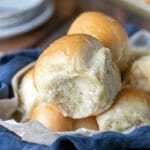 Once butter has melted, sprinkle brown sugar evenly over the pan. Arrange cranberries in an even layer over the brown sugar. Set aside. To make the cake, in a medium bowl, whisk together flour, baking powder and salt. Set aside. 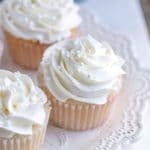 In another bowl, using an electric mixer (either hand or stand), beat together the butter and granulated sugar on until light and fluffy, about 2 to 3 minutes. Add the vanilla and buttermilk; mix well. Add the flour mixture, and stir until just incorporated. Add the cream of tartar, and continue to beat until stiff peaks form. Carefully pour the batter over the cranberries in the cake pan. Bake 45-55 minutes, or until a wooden toothpick inserted into the center comes out clean. Let the cake cool in the pan for 5-10 minutes. Run a knife around the edges of the pan to loosen the cake. Invert onto a serving plate, let stand for 5 minutes, and then lift off the pan. I made this for Friendsgiving, and it was fantastic! Thanks for the recipe. Thanks! I’m glad that you liked it. =) Thank you for commenting! Thanks for the question! I used a 9-inch round cake pan.